Not only did this carpet install take sooooo much longer than the first two installs, this was also my worst work. Boo. Last fall I installed the same carpet (Stainmaster Aristocrat II in Pale Clay, only $.99/sq.ft. at Lowe’s) in my son’s room (read post HERE) and again in Smart Jr’s room (read post HERE) with no problems. So you’d think that the 3rd time would be a piece of cake, but instead I jacked it up a bit. I don’t think laying the carpet bent over the staircase railing for 2 nights was a good idea, because the carpet definitely didn’t lay perfectly flat when I unrolled it, not even after I used the carpet kicker. Oops. I’m sure a carpet stretcher will fix the problem, but it’s such a bummer because I got away with only a knee kicker in the chevron and surf shack bedrooms. I’ll have to look into renting one, although now that I’ve waited a day, the carpet seems to have flattened itself out nicely. The other really funny thing is that I tore out the old carpet in a frenzy when I found out it was bulk trash day. Well, guess what? Bulk trash day is again tomorrow. That’s right, I tore out the carpet exactly 4 weeks ago and I waited until yesterday to put in new tack strips, carpet padding and carpet. I know, I have issues. Um, and my own bedroom looks like this BTW. 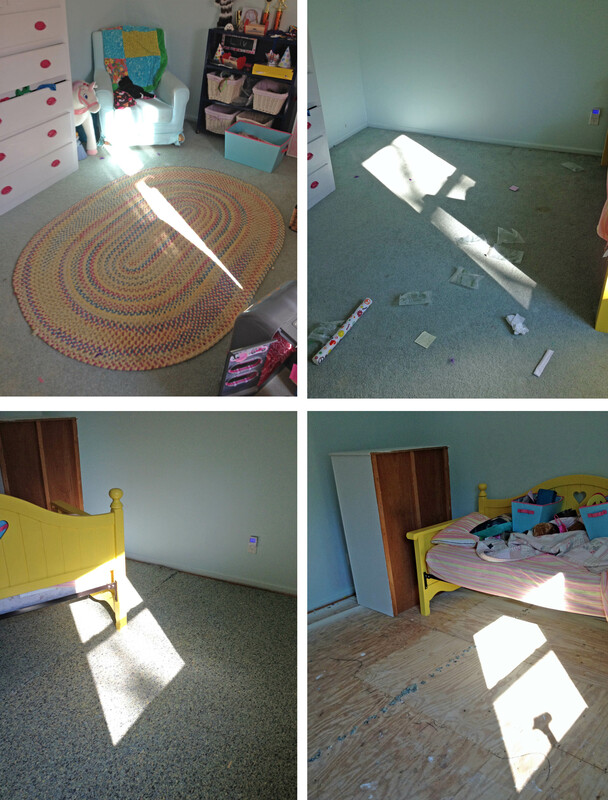 I removed the old carpet and pad and most of the tack strips, which were all rusty for whatever reason. I painted the trim and walls – too bad Lulu chose a blue that was almost exactly the same shade of blue she’s been complaining about for the past 5 years. I screwed down the squeaky floor board, which was like all of them. This room had the worst subfloor, complete with a little note from the builder showing a “High Joist.” Glad I wasn’t trying to put hardwood or something in here. I installed new tack strips. I stapled down the carpet padding. Then I kicked the carpet into place. Thanks Julie! And the sun light is up, I just have to take a picture. She loves it, you were totally right! How much did all of your materials cost? I had pretty much everything else. Let me know if you give it a try!